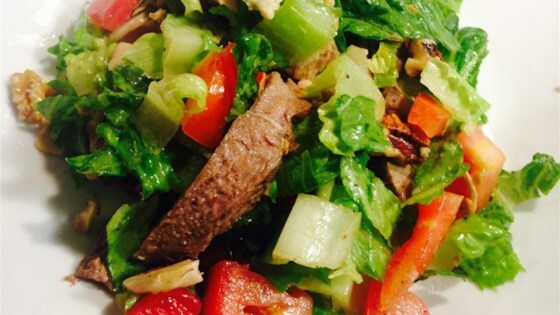 "Interesting twist on the typical steak salad. Broiled sirloin on Romaine lettuce with roma tomatoes, mushrooms, walnuts, and blue cheese with a smoky dressing." Fabulous salad, it was a delicious and filling main course meal! I added some chopped purple onion to the salad, and I substituted extra virgin olive oil for the vegetable oil. Nice quick meal. My husband & I both thought the dressing had to much of a vinegar taste, so will cut back on the red wine vinegar a touch. This salad is excellent. I added guacamole on top and increased the broil time a little for the steak, but besides that didn't change a thing. I will definately make again.